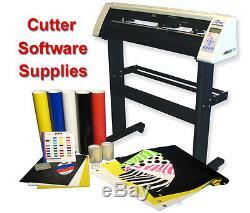 SignWarehouse 31 R Series Vinyl Cutter w/ VE LXi Expert Vinyl Software. Get Up and Going Quickly with this Package! 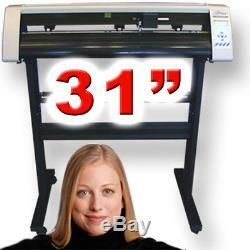 Vinyl Express 31 R-Series Vinyl Cutter & Stand. Vista, Windows 7, Windows 8, 32/64 bit systems. Serial, USB (USB connection is accomplished through serial conversion). NOTE: The R-Series vinyl cutter is NOT Apple/Mac compatible and does NOT have a registration mark sensor for contour cutting after digital printing. Please consider SIGNWarehouse's Q-Series or Graphtec cutters for this ability. Powerful 500 grams of downforce so you can tackle a variety of jobs. Fast 24 inches-per-second cutting speed. Superior build quality offers tension-adjustable pinch rollers and a smooth-feeding media supply system. Best of all, the R-Series vinyl cutter value line is a Vinyl Express® cutter, arguably one of the most prestigious vinyl cutter lines in the world. In fact the whole SignWarehouse company is standing behind you. FlexiSIGN / Vinyl Express LXi Expert Software (Not a Trial Version). PC with 2.0 GHz Processor or better. 128 mb Video Card or better. USB 2.0 Ports (2 or more) and Serial COM Ports. Windows 7/8/10, 32 bit/64 bit. Vinyl Express LXi Expert is one of the most-popular brands of sign-making software in the world and sells for hundreds. LXi Expert is a complete text layout with powerful image scanning program that utilizes both Windows TrueType and Adobe Type 1 fonts. LXi Expert allows you to do simultaneous cutting and text designing of your signs. This is a cost-effective software solution for vinyl cutters just starting out that can grow with your needs. Don't be locked into a dead end software package with no upgrade path or a basic craft/hobby software. You can upgrade LXi Expert to the Master or Master Plus versions. Some reasons to use LXi Expert include. Design Central is your sign layout partner. Customize the interface to suit your work habits. Built-in spell check saves costly mistakes. Edit on-screen any effect applied to an object. Superior text and layout features. From the makers of FlexiSIGN software & FlexiSIGN compatible. Get your sign business started right away! 5 - 24" x 60" Rolls of EnduraGLOSS Vinyl. Here are the points that make it so popular for vinyl cutters: 6 years outdoor durability, 32 colors, easy to cut & weed, outstanding quality & economy, permanent acrylic pressure-sensitive adhesive, thermal printable (not suitable for inkjet printers), great for flat surfaces & simple curves. The supply package comes with 5 - 24 inch by 60 inch rolls. Colors our choice and may vary from picture shown. 2 - 6" x 120" Rolls of Premask. Premask is what helps you easily apply vinyl cutter letters onto the substrate. This premask has features such as low-to-medium tack and easy panel alignment of vinyl during installation, Clear, easy-unwind, no-strech film that resists curling. Designed not to build up or yellow over time. The supply package comes with 2 - 6 inch by 120 inch rolls. 5 - License Plate Blanks. These 0.55 gauge plastic plate blanks accept vinyl letters cut from a vinyl cutter very well. They are Corona treated on both sides, which means the plastic is treated with a very high electric charge. This charge pits the surface of the plastic ever so slightly so that it is much more receptive to vinyl adhesive and to screen printing ink. The supply package comes with 5 license blanks. Colors our choice and may vary from pictures shown. 3 - 12" x 18" Sign Blanks. Endura Cor-plastic corrugated plastic sign blanks with 4mm downward flutes are great for indoor and outdoor signage. It's easy to apply your vinyl letters cut on a vinyl cutter, graphics designs or screen print directly. The supply package comes with 3 - 12 inches by 18 inch blanks. Colors our choice and may vary from the picture shown. Cutter Blades, Squeegee and Clip Art. Add clip art designs to your signs for that creative touch! The supply package comes withDesign Source with 900+ vinyl ready clip art designs and sign layouts, banner templates, and more. 4x8 sign layouts, creatures, stone templates, sign shape designs, curly Q's doodads, arrows, ribbons, flowers, veggies, fruit designs, food, pictographs, nautical, landscapes, artistic touches, hands and more. All can be cut with your vinyl cutter EPS, AI, Win/Mac. The supply package comes with 3 - 45 degree cutting blades & 1 - 4 inch squeegee. Everyone needs supplies to run a business and we can help. These coupons do not work with any other web site. Get up and going fast with everything you need:31 Vinyl Cutter, LXi Expert Software, Supply Package of: Rolls of Vinyl, License Plate Blanks, Rolls of Premask, Sign Blanks, Cutter Blades, Squeegees, Clip Art, Coupons, Coupons, Coupons. The item "Great Starter Pkg Powerful Reliable Vinyl Cutter withSoftware Vinly Sign Plotter" is in sale since Friday, November 25, 2016. This item is in the category "Business & Industrial\Printing & Graphic Arts\Plotters, Wide Format Printing\Cutters- Wide Format". The seller is "signwarehouse" and is located in United States. This item can be shipped to United States.